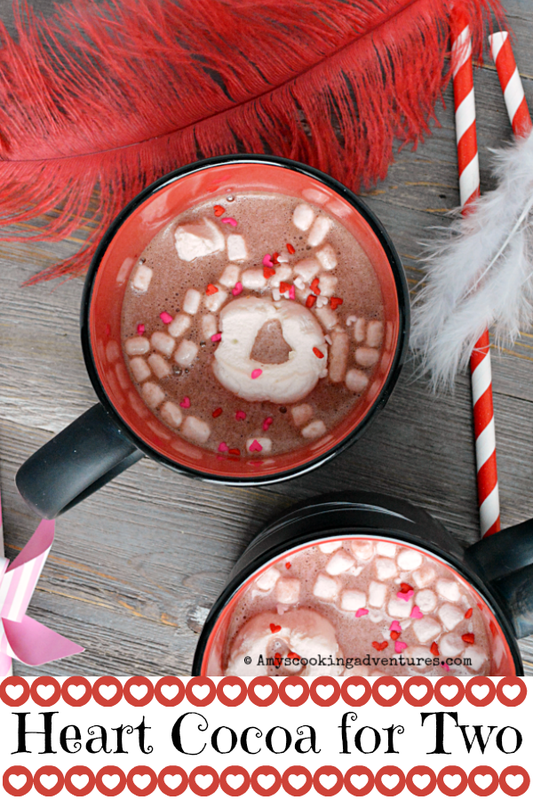 What if I made Valentines hot chocolate for the kids? I found this cute idea for cutting hearts out of marshmallows as a super fun and easy treat! I also added some pink candy melts and it’s tough to see in the picture, but the hot chocolate does have a slight pink hue! So fun! But, as recipes so often do, this recipe is doing double duty! That’s right, this is also my recipe for this month’s Cook the Books Club pick: The Discovery of Chocolate by Janes Runcie. This book would have been much better off as a novella featuring the love story between Diego and Ignacia. The first quarter and the last tenth of the book were the only parts that were worth reading. The part inbetween were mind numbingly boring and nonsensical. The main problem was this: the author wanted an immortal character and therefore introduced time travel, immortality and extremely slow aging (his pulse beats at 1/10 the speed of a normal person so he ages super slowly or something). I'm a huge science fiction fan, so I have no problem with any of these theories except that the cannot co-exist in the same story. Either he's immortal or he ages slowly. Either he lives long because of slow aging or he jumps through time of space. It can't be all of them! This is especially problematic since the time travel element was introduced early in the story, but the reason for the apparent time travel was never addressed (was it a time turner like Harry Potter? Stones like Outlander? A wardrobe like Narnia? A black hole like every sci-fi movie ever? WHAT WAS IT?!?) 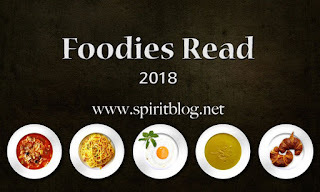 Then time travel is abandoned and slow aging is introduced (and that's fine too - all the vampire/werewolf/fearie stories prepare the reader for immortality)- it simply doesn't make sense to switch from one to the other and it irked me for the rest of the story. Plus the characters were rather boring and the bedroom scenes were just icky - I felt like I needed a shower afterward. Just gross. I feel like I'm being generous giving this book two stars. Since the story was intriguing again in the end, it partially redeemed itself enough to give two stars. I mean seriously, how can you make chocolate boring? So frustrating! Hot chocolate played a huge (and confusing) role in this story, so this recipe fits the bill perfectly. Except, let me tell you something. This recipe totally uses hot chocolate mix, because I would have a full scale revolt on my hands if I tried anything else! My kids love them some swiss miss mix! You could definitely make this with a homemade hot chocolate or a dark chocolate mocha! Ah! So good! 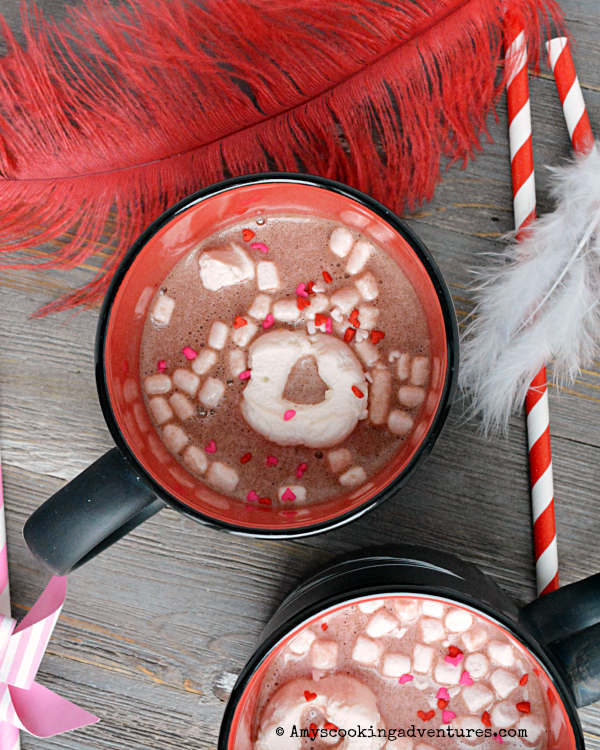 Here are some other amazing Valentine recipes for two! Heat the milk to steaming. Add the candy melts and allow them to sit for 1 minute. Whisk until the candy is melted, when whisk in the hot chocolate mix. Pour into mugs. Use a small heart cookie cutter to cut hearts into marshmallows. Add heart sprinkles just for fun. Heat the milk to steaming. Add the candy melts and allow them to sit for 1 minute. Whisk until the candy is melted, when whisk in the hot chocolate mix. Pour into mugs. Use a small heart cookie cutter to cut hearts into marshmallows. Add heart sprinkles just for fun. I'm sorry the book turned out to be a bust but I love the recipe. My kids would be super excited about this (they got pink hot chocolate last year for Valentine's Day). Can't wait to try it! I wasn't crazy about the book either. I was surprised though, because I know you like fantastical stories. My dish for Cook the Books is also doing double duty next week. What a fun drink! It's perfect for a cozy night by the fire! I love a good cup of cocoa on chilly winter nights! Yep. Started out loving it. Skimmed through the middle section. HATED the Hershey Kiss segment. I was horrified. Good cups 'o cocoa. The hot chocolate looks wonderful - nice when even a not-so-enjoyed book leads to something delicious! Yeah...this wasn't my favorite either. But I would love a mug full of this deliciousness, Amy. Nice job. I adore a good cup of hot cocoa and having it pink-ish with heart marshmallows cutouts and sprinkles makes it even better. Not ingredients I have on hand or would use, but sounds like the kids loved it. My cup of cocoa is very simple. Ground cacao nibs in a French Press with hot water.